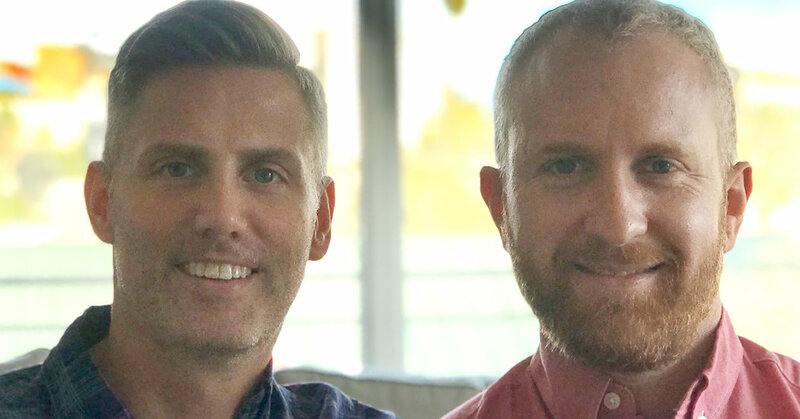 Christopher Michael Ray Slye and Jeremy Scott Woolf were married March 22 at Casa De Monte Vista, a private estate in Palm Springs, Calif. Louis J. Woolf, the uncle of Mr. Woolf who became ordained by the American Marriage Ministries for the event, officiated. Until August 2018, Mr. Slye (left), 42, was the retail marketing and events manager for Tishman Speyer, a real estate company in New York. He is a son of Joyce A. Slye of Lakeridge, Va., and H. Ray Slye of Leesburg, Va. Mr. Slye’s mother, who is retired, was a supervising manager of the service department at Canon in Arlington, Va. His father is the president of the All Seasons Corporation, a commercial real estate cleaning company in Leesburg. Mr. Woolf, 37, is the director of marketing and communications for First, an events agency in New York. He is a son of Beth M. Woolf of Chappaqua, N.Y., and the late Dr. Paul K. Woolf. Mr. Woolf’s mother is the residency program coordinator for the Westchester Medical Center in Valhalla, N.Y. His father was a pediatric cardiologist for the Westchester Medical Center. The couple met in June 2009 through a mutual friend in Washington.